The evocative image of three Greek temples standing in the fields of poppies is not easily forgotten and makes the treck to the archelogical site of Paestum well worth the effort. The temples are among the worlds best preserved monuments of the ancient Greek world, remnants of Magna Graecia, as the Greeks called there colonies in southern Itlay and Sicilia. The samll town is close to some of Italys better beaches and just south of where US forces landed in 1943. 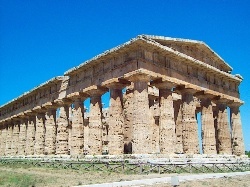 Paestum or Poseidonia as the city was first known, was founded in the 6th century BC by Greek settlers from Sybaris, on the Golfo di Taranto farther east. Conquered by the Lucanians from Basilicata in the 4th century BC, it came under Roman control in 273 BC and it became an important trading port. The town was gradually abondoned after the fall of the Roman Empire, period outbreaks of malaria and savage raids by the Saraceans in 871. The temples were rediscovered in the late 18th century by road builders who subsequently ploughed right through the ruins. The road did laittle to alter the state of the surrounding area though, which remained full of malaria swamps teeming with snakes and scorpions, until well intot he 20th century. The state of affairs belongs to the past and the site is now easily travelled by foot. All public tansport is within walking distance. The first temple you come acroos when you ente rthe site from the northern end, is the Temple di Cerere (Temple of Ceres), which dates form the 6th century BC. It was the smallest of the three temples and was used as a Christian church for a time. The basic outline of the foro (the center of the ancient city) is evident as you head south.Among the buildings, parts of which remain, are the Italic temple, the Greek theatre, the Bouleutrion, where the senate met and farther south, was amfiteatro, through which the road was built. The Temple di Nuttono (Temple of Neptune), dating from about 450 BC, is the most impressive of the remais and the largest and best preserved, with only parts of the inside walls and roof misisng. From a distance, its structure gives the impression that the columns are leaning outward. Virtually next door, the so – called basilica is the oldest surviving monument in Paestum, datign from the middle of the 6th century BC. With nine columns across and 18 along the sides, it is a majestic building. In the front of the building you can make out remains of the sacrificial altar. The city was ringed by 4.7km of walls, built and rebuilt by Lucanians and Romans. The most intact section is west of the ruins, but the area to the east makes for a pleasant walk through the local farmland. The Museo di Paestum, opposite the site, houses a collection of metopes, including 33 of the original 36 from the Temple di Argive Hera, 9km north of Paestum.